If you've ever gotten choked up listening to public radio, chances are you were listening to a StoryCorps segment. 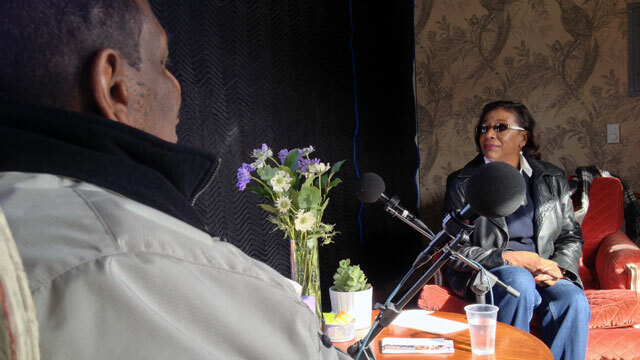 StoryCorps records testimonies of everyday Americans, often in booths and makeshift studios. The oral histories are broadcast weekly on NPR’s Morning Edition. This weekend, a recording booth is in San Francisco's Bayview Hunters Point neighborhood. But the booth is not a typical StoryCorps structure. The inside of the industrial gray container has been outfitted to look like a living room, complete with wallpaper, two armchairs, and a rug. A big picture window cut out of one wall offers a view of the bay. “It’s really a place to try to bring a home-like atmosphere, so people feel comfortable telling their stories,” Burnham said. Bayview native Andrea Gooden came with her younger brother to tell the story of their parents. "Growing up here for me was a lot of love, neighbors looking after neighbors. But a lot of the men who were going off to the war never came back, or ended up in jail. So my dad was the guy that all the kids who didn't have fathers would knock on the door and say, 'Can Dad come out and play?'" Gooden said. "Dad died this year. So we're going to talk a little bit about that. What was it like growing up, feeling loved, being poor, but not knowing it because we were so rich with love." Gooden works for PG&E in environmental remediation. The utility helped fund the recording project, which is on the site of a former PG&E power plant. These stories will help preserve the history of the Bayview, said Jacqueline Flin, who runs A. Philip Randolph Institute San Francisco, a longtime workers’ rights and civil rights organization that also helped bring the recording project to the neighborhood. Some recording slots remain on Sunday for Bayview residents, and more recording events are planned for early next year. If you’re interested in participating, call 415-265-0228.